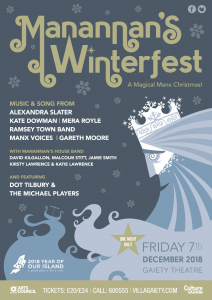 Home › Culture › Manannan’s Winterfest – A Magical Manx Christmas! There’s something new on the Christmas calendar this year with the introduction of a sparkling new event at the Gaiety Theatre under the title of Manannan’s Winterfest – A Magical Manx Christmas! Billed as a unique concert celebrating Manx Christmas traditions, the event will be a collaboration of the Island’s finest exponents of classical, folk, brass and choral music – topped with local humour and drama. The brainchild of local musicians David Kilgallon and Malcolm Stitt, their aim is to combine both the old and the new and fix Manannan’s Winterfest firmly on the Manx calendar. It’s an idea which grew synergistically from several conversations between them as they reminisced about traditional, childhood memories and their shared love of performing Christmas music. The Year of Our Island initiative proved to be the catalyst for the event, and with the help of friends and families the show promises to be an exciting, new experience for anyone looking for a great night out at the beautiful and historic Gaiety Theatre. Hosted by the inimitable Dot Tilbury, the list of entertainers will include the BBC Radio 2 award-winning folk harpist Mera Royle, Alexandra Slater and the legendary Michael Players. Also within the musical mix will be some rousing festive sounds from Ramsey Town Band, well-known carols from the choir Manx Voices and Gareth Moore on the piano: as well as a world renowned collective of Celtic musicians including David Kilgallon, Malcolm Stitt, Jamie Smith and the Lawrence sisters. It’s also hoped to include the stunning Whiteboys during the evening, which reflects an old Manx custom including drama and comedy. Sponsored by Year of Our Island 2018, Culture Vannin, the Isle of Man Arts Council and the Malcolm Dickinson Charitable Trust, tickets priced at £24/£20 are available from www.villagaiety.com. ‹ 2018 Convention in Victoria British Columbia was a riot!